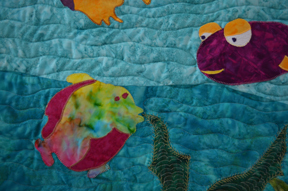 Explorations in Quilting and Life: Completed! This was such a fun project! The request was simple - a baby quilt for someone who is a marine biologist. I wanted it to be simple and an opportunity to work on skills. I designed the whole piece and had a great time coming up with colors for the fish. I used wool batting for the first time. I had read in a recent Quilting Arts article that wool batting is easier to work with if you are not on a long arm. I found it much lighter and easier to move around for free motion quilting. 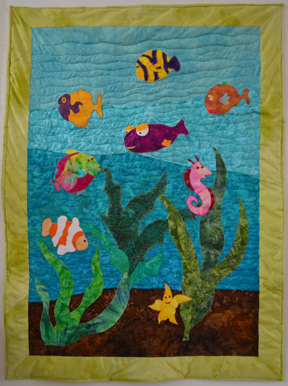 As I wanted to keep a fair amount of loft in the quilt, I used a very simple quilting pattern of wavy lines for the ocean section. I also decided to leave the border unquilted. The dark green plant actually has a fair amount of contrast as it is quilted somewhat heavily with a light colored thread. All in all I was totally delighted with my design and ease with which I could applique and quilt it. Hope the baby likes it too! Close up of some fish. What a fun quilt. They are going to love it!